In geology, a sill is a tabular sheet intrusion that has intruded between older layers of sedimentary rock, beds of volcanic lava or tuff, or along the direction of foliation in metamorphic rock. A sill is a concordant intrusive sheet, meaning that a sill does not cut across preexisting rock beds. Stacking of sills builds a sill complex  and a large magma chamber at high magma flux. In contrast, a dike is a discordant intrusive sheet, which does cut across older rocks. 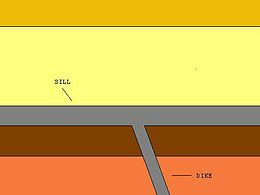 Sills are fed by dikes, except in unusual locations where they form in nearly vertical beds attached directly to a magma source. The rocks must be brittle and fracture to create the planes along which the magma intrudes the parent rock bodies, whether this occurs along preexisting planes between sedimentary or volcanic beds or weakened planes related to foliation in metamorphic rock. These planes or weakened areas allow the intrusion of a thin sheet-like body of magma paralleling the existing bedding planes, concordant fracture zone, or foliations. Despite their concordant nature, many large sills change stratigraphic level within the intruded sequence, with each concordant part of the intrusion linked by relatively short dike-like segments. Such sills are known as transgressive, examples include the Whin Sill and sills within the Karoo basin. The geometry of large sill complexes in sedimentary basins has become clearer with the availability of 3D seismic reflection data. Such data has shown that many sills have an overall saucer shape and that many others are at least in part transgressive. ^ Leuthold J.; Müntener O.; Baumgartner L.; Putlitz B. (2014). "Petrological constraints on the recycling of mafic crystal mushes and intrusion of braided sills in the Torres del Paine Mafic Complex (Patagonia)". Journal of Petrology. 55 (5): 917–949. doi:10.1093/petrology/egu011. .
^ Annen C.; Blundy J.D. ; Leuthold J.; Sparks R.S.J. (2015). "Construction and evolution of igneous bodies: Towards an integrated perspective of crustal magmatism". Lithos. 230: 206–221. doi:10.1016/j.lithos.2015.05.008. ^ Hamilton M.A. ; Pearson D.G. (2011). Srivastava R. (ed.). Precise U-Pb Age for the Great Whin Dolerite Complex, N.E. England and Its Significance. Dyke Swarms: Keys for Geodynamic Interpretation. Springer Science & Business Media. ISBN 9783642124969. ^ Polteau S.; Mazzini A.; Galland O.; Planke S.; Malthe-Sørenssen A. (2008). "Saucer-shaped intrusions: Occurrences, emplacement and implications". Earth and Planetary Science Letters. 266: 195–204. doi:10.1016/j.epsl.2007.11.015. ^ Thomson K.; Hutton D. (2004). "Geometry and growth of sill complexes: insights using 3D seismic from the North Rockall Trough". Bulletin of Volcanology. 66 (4): 364–375. doi:10.1007/s00445-003-0320-z. ^ Planke S.; Rasmussen T.; Rey S.S.; Myklebust R. (2005). Doré A.G.; Vining B.A. (eds.). Seismic characteristics and distribution of volcanic intrusions and hydrothermal vent complexes in the Vøring and Møre basin. Petroleum geology: north-west Europe and global perspectives : proceedings of the 6th petroleum geology conference held at the Queen Elizabeth II Conference Centre, London 6-9 October 2003. ISBN 9781862391642.